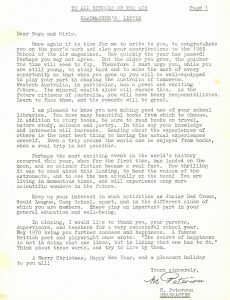 Headmasters Letter from 1969 Aerial Magazine. 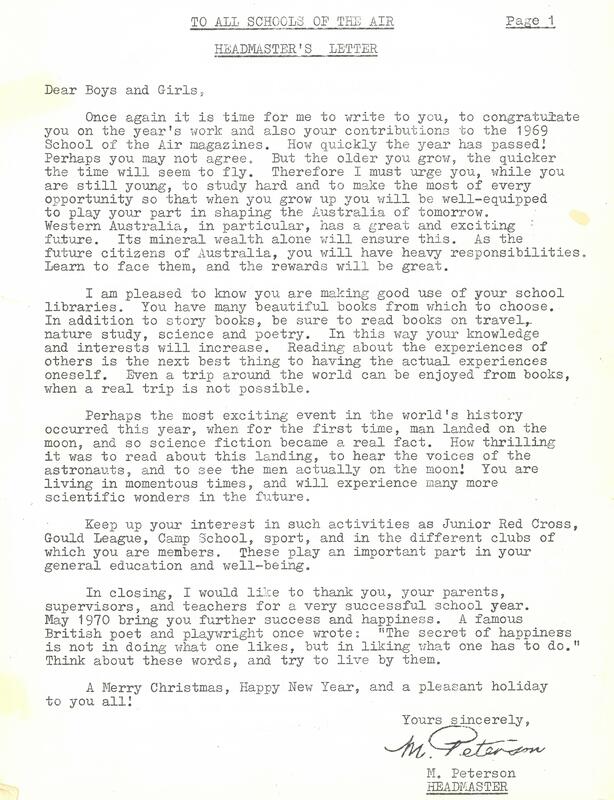 The Meekatharra School of the Air commenced operations on 14th September, 1959. It was the first School of the Air to be established in Western Australia, and came into being thanks primarily to the inspiration and efforts of Mrs Rhonda Finch of Lorna Glen Station, via Wiluna. Rhonda enlisted the aid of the Country Women’s Association, particularly through the Inlanders’ (Wiluna) and Murchison Air Branches, and together they persuaded the Education Department to establish a radio service at Meekatharra – per favour, of course, of the Flying Doctors Service (later to become the Royal Flying Doctor Service). The Education Department input at this stage was fairly minimal – one teacher! The teacher, John Smedley, had formally been the itinerant teacher in the district, so he had the inestimable advantage of knowing most of his students, their families and their lifestyles. The school’s other asset in these early days (apart from the enthusiasm of the pupils and their families) was the F.D.S. Base Operator Everett Bardwell. He supplied the technical assistance, shared his studio, lent a room at base for the “School: and even provided a desk and a chair. Any lack of enthusiasm from the Department was more than compensated for by the participants! In time, the School moved out of the R.F.D.S. Base into a small house next door. Here, the teacher had a bedroom, a work room and a studio. He also took over the responsibility for marking the children’s papers, which necessitated a second teacher, which in turn necessitated more teacher accommodation. A second teacher was found who already lived in Meekatharra, so that problem was temporarily averted. At first, the only children who could enrol with the School were those whose parents owned a suitable transceiver. By 1964 the P&C had raised sufficient funds to persuade the Department to initiate a transceiver hire scheme. The transceivers were owned by the Correspondence School, managed by the P&C and paid for by the P&C, the Lotteries Commission and the Education Department jointly. They were leased for $8 a term on a needs basis, but there were never enough and raising money for transceivers was a constant preoccupation with the P&C. Other interests of the P&C at this time included raising funds for a School lending library, organising Christmas parties and end-of-year camps for attending sports days with other schools in the area at Cue. The school was gaining strength and acceptance with both the community at large and the Education Department in far-away Perth.